Xenia head football coach Trace Smitherman smiles after being handed the Thursday Night Lights football trophy, Oct. 25 at Doug Adams Stadium. Smitherman was named the OHSAA Southwest District Division II Coach of the Year on Nov. 15 by a panel of area sports writers. Fairborn linebacker Hunter Warner (9) tackles a leaping Xenia running back Sincere Wells during a season ending game Oct. 25 in Xenia. Both area players received Division II first team all Southwest District honors this season. 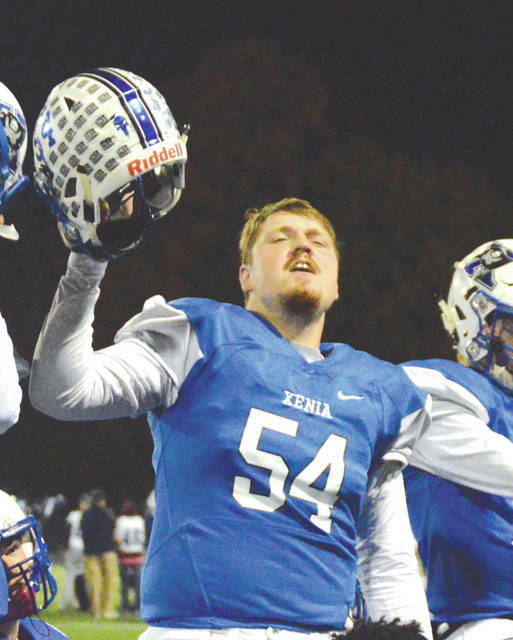 Xenia senior center Sam Lockwood was named as a first team all-Southwest District offensive line selection this season. Buccaneers senior linebacker Nick Willis was named a Division II first team all-Southwest District pick this season. 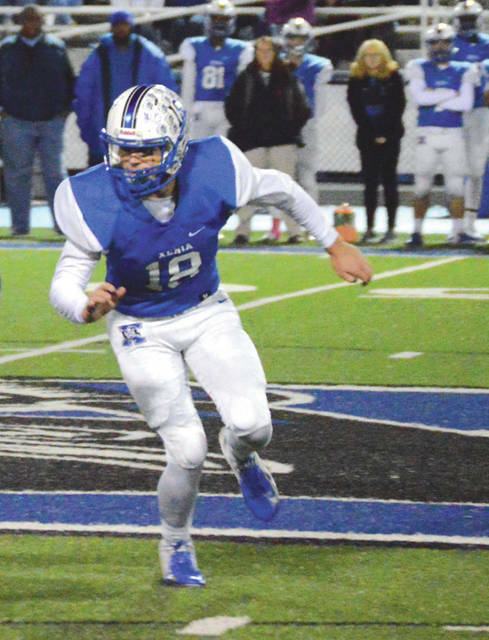 XENIA — A total of eight Greene County area high school football players and a head coach were selected to their respective 2018 OHSAA All-Southwest District teams Nov. 15 by a panel of SW Ohio sports writers. 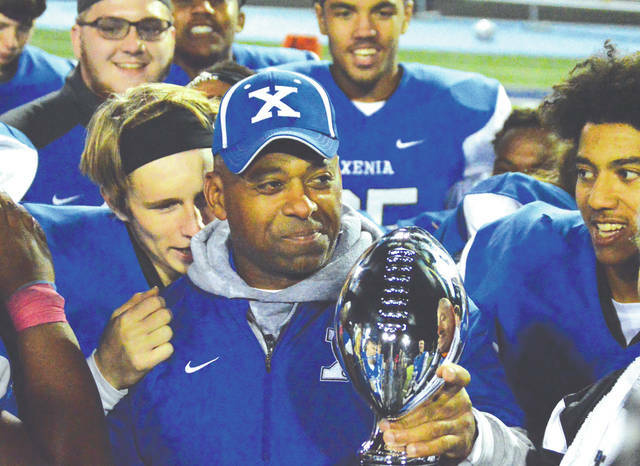 Xenia head coach Trace Smitherman headlined the area’s Division I and II selections after he was named the Division II district’s Coach of the Year. Smitherman led the Bucs to the Greater Western Ohio Conference’s American South Division title and a 7-3 overall record. Smitherman wanted to make sure to give credit to his coaching staff — assistant coaches Matt Bartley, Brian Bogenschutz, Ty English, Jeff Dekker, Greg Fenwick, Tony Greer, Nick Jones, Vince Pupero, Ja’Von Hammonds, Cedric Tolbert and Mack Bottorff — stating that they were a key component to the team’s success this season. Xenia placed three Buccaneer players on the Division II first team, and one on the D-II district second team. Buccaneer standout running back Sincere Wells and center Sam Lockwood were both named to the District’s first team offensive squad. On defense, linebackers Hunter Warner of Fairborn and Xenia’s Nick Willis were both selected to the D-II district first team. 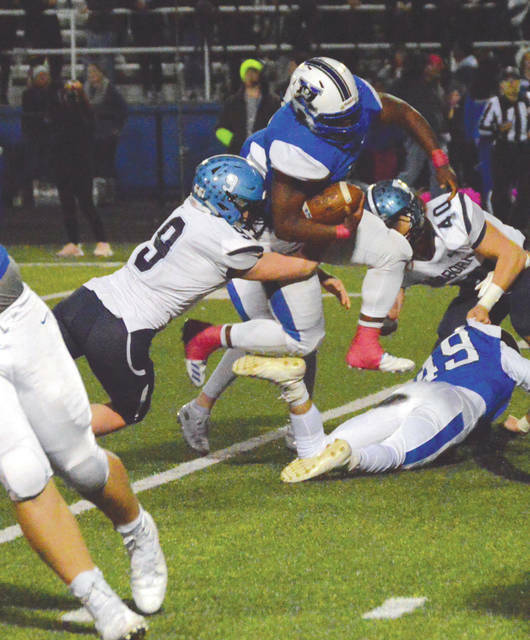 Fairborn’s Gage Barron was a second-team selection as a receiver, Xenia’s Peyton Bartley and Fairborn’s Joey Bowling both made the second-team district squad as offensive linemen, and the Skyhawks’ Mark Peterangelo was named to the second-team district team as a defensive back. Among Greene County area schools, Beavercreek is the lone representative in Division I. The Beavers placed defensive back Maurice Wilson on the SW District second-team defensive squad. Beavercreek running back/defensive back Christopher Lawrence and linemen Jason Smith and Connor Tinch were named on the D-I District Honorable Mention team. Contact John Bombatch at 937-372-4444, Ext. 2123. A story on the Greene County area’s All-Southwest District high school football selections for Divisions III, V and VII is scheduled to run on Tuesday, Nov. 20. Please visit xeniagazette.com/sports to see a complete listing of the D-I and D-II all-district teams.